Groudon has finally made it into Pokemon Shuffle as a Special Stage. It will be live until 4/27/2015. Groudon is ground type and has to be defeated in 20 moves. Groudon is a Legendary Pokemon and should be a nice addition to any players Pokemon Shuffle team just like Kyogre. After the first time you defeat Groudon - the game awards players with 3000 coins. So what are you waiting for? 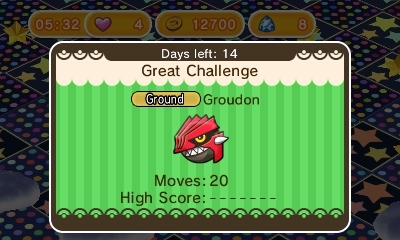 Go check-in to get the Groudon stage and defeat him!